In the past I have made regular raw carrot cake, mini raw carrot cake cheesecakes on this blog, and raw carrot ginger dream cakes, and they were delicious...but this weekend I was thinking about what would happen if I combined those three and made them even more delicious, in the Ultimate Raw Carrot Cake. I am sort of on a carrot in dessert kick lately (which is not a bad thing since I love things like carrot cake). It seemed like the perfect time to attempt to make the best carrot cake I have ever made since I bought a lot of carrots last week when I was at the store. 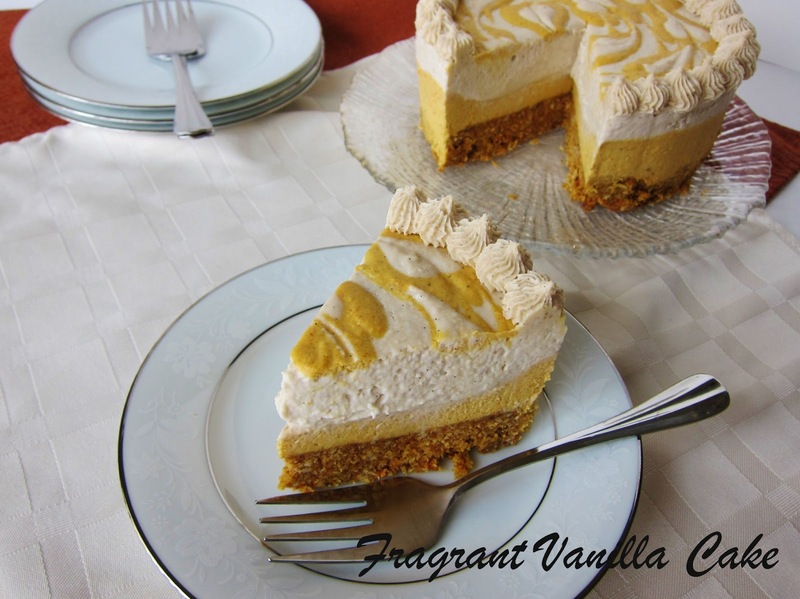 I love the cake part of carrot cake, but I love the filling just as much so I wanted this cake to have moist carrot cake AND lots of smooth creamy filling. Which is exactly why I made a cheesecake carrot cake. I made my classic raw carrot cake for the base with plenty of ginger and spice (because that is essential as far as I am concerned in carrot cake), and that part was delicious, but I knew it would be even better once I added the last 2 elements of the cake. 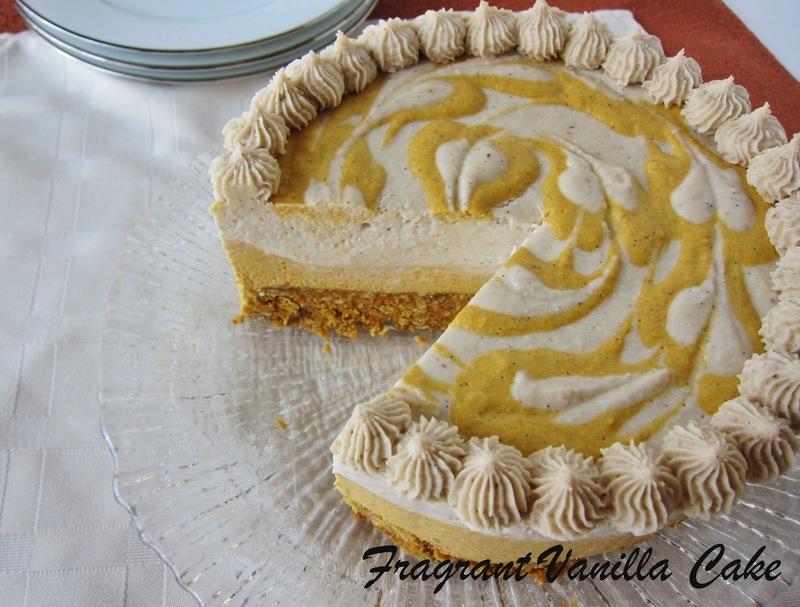 I next added a layer of spiced carrot cheesecake, then a vanilla bean layer to make it extra luscious and to serve as the cream cheese "frosting" which is one of my favorite parts of carrot cake. I actually like frosting so much that I eat cake first then the frosting (yes, even as an adult), so it was important that this cake had plenty of creamy stuff on top. It was the most amazing carrot cake I have ever eaten. I love carrot cake, but I love cheesecake even more so the two of them combined into the ultimate carrot cake was heavenly! For the cake, in a food processor, combine the oat flour, coconut flour, sea salt, dates, vanilla, ginger, cinnamon, cardamom, and process until the dates are incorporated and it is all well blended. Add the coconut and 1 cup of the carrots and process until pretty smooth. Add the remaining carrots and pulse until incorporated. Place the batter on a teflex lined dehydrator sheet, and dehydrate for about 8 hours, until dried but still moist in the center. Once dried, cut into a 6 inch circle, place in the bottom of a 6 inch springform pan (greased with coconut oil), and set aside. To make the filling, combine the cashews, coconut meat, coconut nectar, sea salt, vanilla, and coconut water and process until smooth. With the motor running, add the coconut oil slowly to incorporate it. Divide the filling into 2 bowls, and add one back to the dehydrator. Add the carrots, ginger, cinnamon, cardamom, and process until smooth (you may need to press through a fine meshed strainer to remove carrot bits for really smooth filling). Pour the carrot filling over the cake in the pan (reserving about 1/4 cup). Next pour over the plain filling. 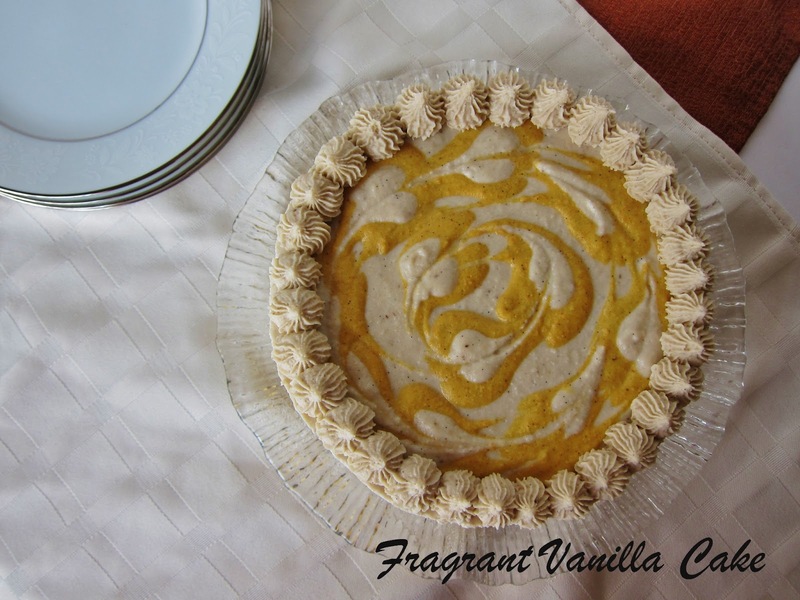 Drop the remaining carrot filling by the tspful over the vanilla, tap the bottom on the counter to lever, then swirl with a knife or skewer. Place in the freezer to set, about 4-6 hours. For the optional cream topping, combine all ingredients but the coconut oil in the food processor and process until smooth. With the motor running, add the coconut oil slowly and process for a minute until well incorporated. Remove from the processor and place in a bowl. Put the bowl in the freezer for about 45 minutes or until it is the consistency of frosting. Place in a pastry bag and pipe around the edges of the cake. Serve! Store extra cake in the fridge. 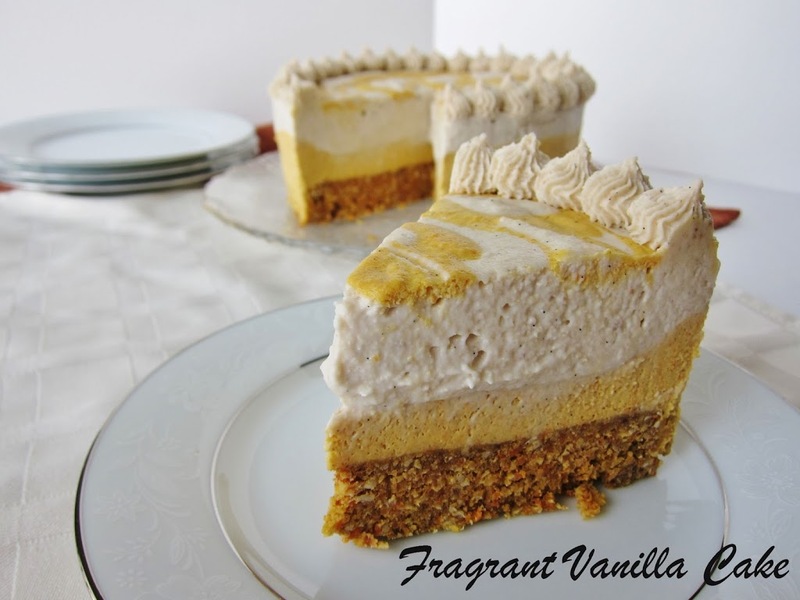 Is this the recipe for the Fragrant Vanilla cake shown in the photos? The words "Frangrant Vanilla Cake" on the pictures is the name of her blog, not the name of the cake. 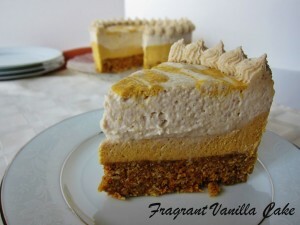 The recipe above is for the cake pictured which is the Ultimate Raw Carrot Cake. Looks devine by the way! Thank you :)! Love your pun ;). Little work of art.. Looks beautiful!! Wow, my eyes literally bugged out when I saw that frosting. This looks AMAZING!! Thank you :)! You could put it in the oven for a short time at the lowest temp, or you could leave it raw I suppose, but it would not quite hold together as well. It would still taste good though ;). Thank you :). They would! Question, I just put the cake part in the dehydrator, but I was wondering about tart the cream cheese layer will be? I noticed you didn't add any lemon juice or apple cider vinegar to it, and I was thinking about adding little to keep more tart and dairy-like. What do you think? It tasted perfect as it was to me and my taste testers (the sea salt helps it taste like cream cheese), but if you would like you can add a tsp of cider vinegar. Thanks, you're probably right about the sea salt part. It's your recipe after all, I shouldn't have doubted you LOL. BTW the cake was done dehydrating this morning and it tasted so good we just wanted to eat it all right then and there! Thanks for a such a wonderful recipe, you've got me believing in the raw diet again! It is ok ;). So happy you and your family enjoyed it :)! I am happy you are getting into raw :)! I dehydrated the cake in the oven, on the lowest setting. The cake is quite crumbly, it stuck together before I dehydrated. Are my crumbles correct? You might have baked it too long, it should not crumble. When I made mine in the dehydrator it was still very moist after dehydrating. Next time I would check it sooner. Is the batter supposed to just look like crumbs? I've never done a raw anything before.... Isn't a batter typically somewhat most? All I've got so far is dry crumbs, like bread crumbs, that barely stick together when pressed.... What am I doing wrong, or is it fine???? It is before you add the carrots, but then it should look more like thick batter. Your dates might have been a little too dry, so in that case you can add a little liquid sweetener to make the cake more moist (such as raw agave nectar or maple syrup)or just a little water a Tbsp or two at a time.